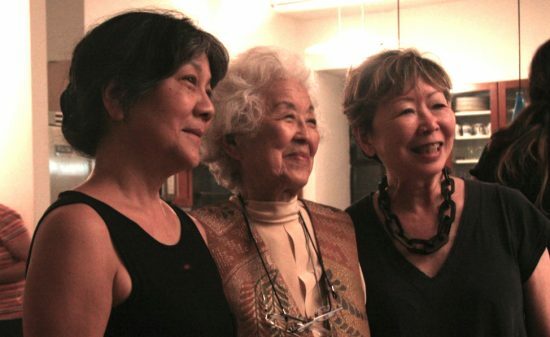 Aiko Herzig Yoshinaga (center) in New York with activist Julie Azuma and artist Tomie Arai. Recognized as No. 1 of “Five Japanese American Women Activists Left Out of U.S. History Books” by Yes Magazine, Aiko Herzig Yoshinaga is nothing short of a national treasure in the Japanese American community. A new biopic, “Rebel with a Cause: The Life of Aiko Herzig Yoshinaga,” directed by Janice D. Tanaka, chronicles her remarkable and dramatic life. The film premieres on Sunday, April 24, at 1 p.m. at the Downtown Independent Theater, 251 S. Main St., as part of Visual Communications’ Los Angeles Asian Pacific Film Festival with an encore screening on Tuesday, April 26, at 4:30 p.m. at the Japanese American National Museum’s Tateuchi Democracy Forum, 100 N. Central Ave. in Little Tokyo. Yoshinaga is scheduled to attend the Tuesday screening. According to Tanaka, the film was a spinoff of “Right of Passage,” her recently released documentary on the tumultuous legislative journey to win redress for Japanese Americans incarcerated during World War II. Since Yoshinaga spent much of her working career in New York, the documentary offers an unprecedented, rarely seen glimpse of the Japanese American community there with groundbreaking organizations like Asian Americans for Action, the Basement Workshop and Chickens Come Home to Roost. Of course, her story would not be complete without her contribution to the redress effort. Using never-before-seen footage and photos, “Rebel with a Cause” is at once a deeply personal story for Tanaka as well as a celebration of a Nisei woman’s transformation from the ordinary to the extraordinary. Tickets for the screening are available online at www.vconline.org/festival, by phone (213) 680-4462, or in person at the screening venues.